AGC OFF instead of slow AGC. 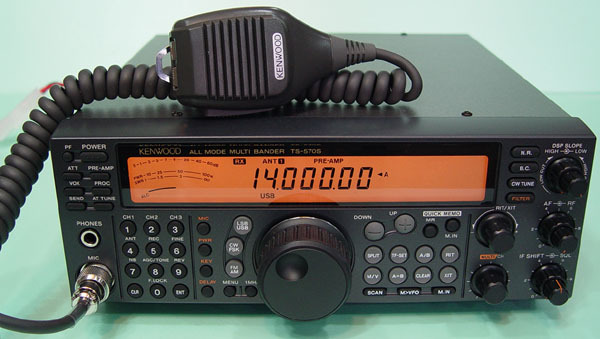 This mod based on modification performed by TS570 designer (http://www11.cds.ne.p/~cqdx/engagc.htm (внешняя ссылка)). As there, AGC is switched off by shorting pin 14 of IC15 to ground. I made only one small change in AGC OFF control circuit — AGC is my TS570S is still controlled by AGC button. In my solution npn transistor between pins 14 and 13 of IC15 controlled by AGS signal (from pin 10 of IC14 via 20k resistor). It allows to avoid patch cutting, external switches etc. Additionally — display reading corespond to current AGC state. Mod can be easy removed to enable slow AGC back. This mod was made and checked by myself on my TS570S without problems. But if you try this mod on your own equipment, must be aware — it is at your own risk. If you have any doubts, do not have the proper tools or knowledge — please do not attempt this modification yourself. * IC 14 — BU4066 SMD integrated circuit. 2. Identify IC’s pins numbers. * «B» – to resistor 22 kOhm. 4. Carefully solder second side of wire (from 22 kOhm resistor) to pin 10 of IC14. Now your TS570 has fast AGC (shown by display as «fast») or AGC OFF (no info about AGC on display) controlled by AGC button.